We went in to the city in the early evening yesterday. We walked around the Brooklyn Bridge area (I will post about it later.) We had some extra time before our train came, so we went outside and watched the hard-working taxis. 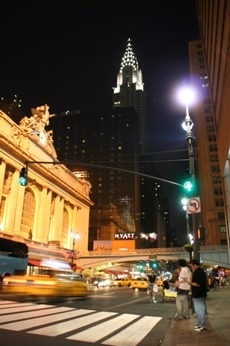 That was when I took this shot of Grand Central and the Chrysler Building sparkling. Cool to be in NYC at night!